We are often asked if it is normal for turtle shells to peel. Yes it is very common for the shells of many water turtle species to peel periodically. Look at Rusty, a male midland painted turtle. Rusty has the the frizzes. A turtle shell is bone. A shell is not just one big bone but rather many bones joined tightly together. The shell bones are covered by horny plates call scutes. The scutes do not correspond to the individual bones. It is the scutes that are replaced from underneath shedding the outer layers. Peeling is a cleaning process most common to turtles that frequently bask. Basking in the sun is a means of raising the turtle's temperature. Anything on the turtle's shell like algae reduces the turtle's ability to absorb heat and slows the turtle in water. Peeling sheds the dirty layer exposing a fresh clean layer of scutes. When Emily our Florida red-bellied turtle came to live with us, she was covered with algae. It took some work she did not appreciate to get her clean. Other sources of contamination removed be peeling are oils and fats. Vegetable oils or scum result from decaying plants, pollen, etc. Fats may come from dead animals the turtles were feeding on. These substances float on the water and coat the turtles as they exit and enter the water. This is common where wind blown scums collect at the edges of bodies of water which are also places turtles frequent. Fats may also come from food we feed our turtles like canned dog food. Peeling may occur any time of the year. Some turtles may begin peeling about the time they enter hibernation. Then in the spring when they emerge and bask they peel big time. We call this "the frizzes". Rapid growth also causes peeling. 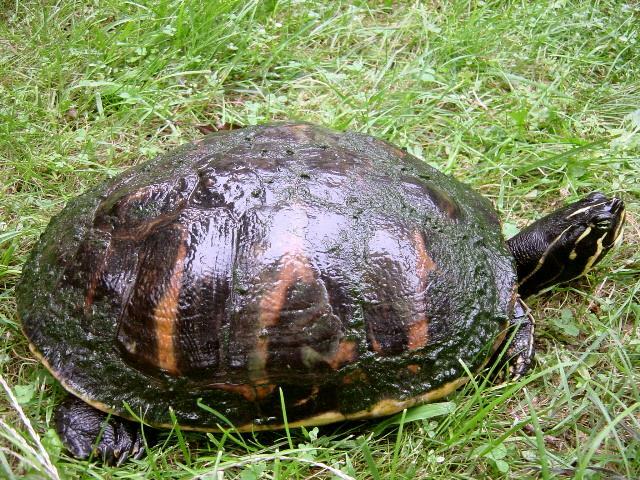 Peeling is not as common among turtles who do not bask frequently like snapping turtles and musk turtles. They are often covered with algae. There is no harm in pulling the peeling scutes off a turtle as long as they come off easily. Scutes not peeling because of tightly adhering algae can be eased off with a knife blade. Turtles like box turtles do not normally peel. However, they may peel as part of a healing process. Scutes may also regenerate where they were lost by accident or injury. Scutes may also be scratched or worn off by repeated scrapping over rough rocks. If this happens to our turtles, we change the rocks. If we see bone exposed by injury or wear, we treat it like a wound. Common antiseptics in your medicine cabinet are appropriate. We like to coat the exposed bone with "New Skin" which is an antiseptic that goes on like nail polish. We take the one from the medicine cabinet for the turtles and get a new one for ourselves. Peeling turtle skin is not common and does not normally occur as a shell peels. Shedding skin may be caused by over soaking in water, too much vitamin A, or fungal infections. We investigate and treat if necessary. We can not say that turtles are aware of the peeling or whether they are bothered by it. We can only imagine that they feel better after the peeling scutes fall off. They do not appear to appreciate our pulling them off. Some of the scutes can be quit thick like the scutes on the plastron of Ribbit our yellow-bellied slider. So if your turtle gets the frizzes it is probably normal. Have fun picking off the scutes or picking the scutes out of your aquarium. We hope you enjoyed our behind-the-scenes tour. Come back again.